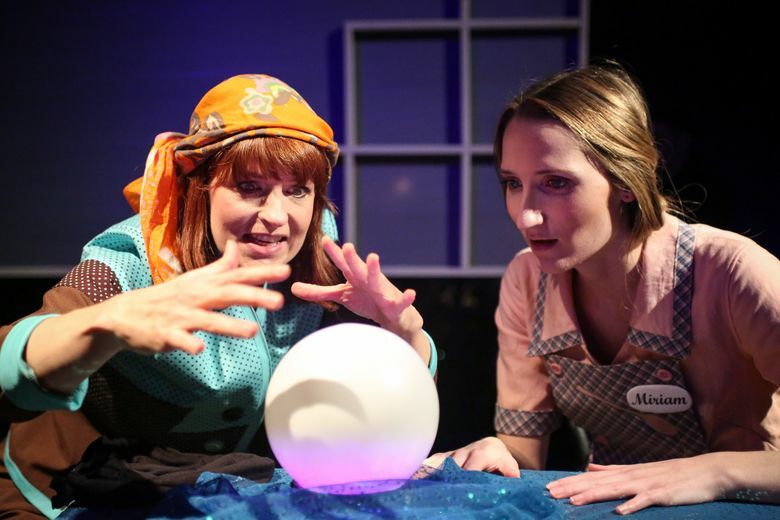 A review of Reboot Theatre’s production, on stage at the Inscape Arts Building through Nov. 19. The woman (Mandy Rose Nichols, employing a considerable bag of shtick), our narrator and the personification of every broadly accented minor character, eventually revs up the narrative engine, but as “Fly By Night” stretches on and on, past several false climaxes and the 150-minute mark, it becomes clear that the beginning is not this show’s problem. 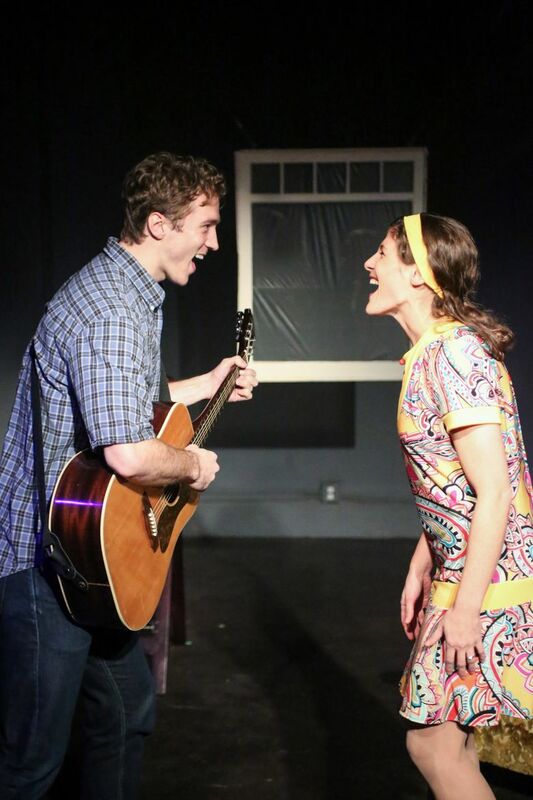 Conceived by Kim Rosenstock and written by Rosenstock, Will Connolly and Michael Mitnick, “Fly By Night” has a cute, if hokey, story engineered around the massive Northeast blackout of 1965, and an array of easy-on-the-ears guitar- and piano-based songs. by Kim Rosenstock, Will Connolly and Michael Mitnick. Through Saturday, Nov. 19, at Slate Theatre in the Inscape Arts Building, 815 Seattle Blvd. S, Seattle; $15-$20 (reboottheatre.org). It’s also an object lesson in how to systematically burn through an audience’s goodwill. A mildly clever structural tic that tells the story not entirely chronologically starts to feel like stalling on the narrator’s part. An initially nimble book bloats to accommodate an individual catharsis for every moderately important character. The score reprises nearly every song, and around the third or fourth appearance of certain melodies, they start to sound less like catchy tunes and more like relentless earworms. And then there’s the ending, a tonally sour note after two-and-a-half saccharine hours. “Fly By Night” is the first extended production for new company Reboot Theatre, which last year presented a one-weekend, all-female “1776.” This staging, directed by Harry Turpin and featuring a couple gender-reversed castings of its own, has a scrappy appeal that persists even as the show’s fades. The three points of the love triangle here are sisters Daphne (Janet McWilliams) and Miriam (Tara Nix) and the goofy deli worker, Harold (Garrett Dill), they each meet separately shortly after moving from South Dakota to New York City. Daphne has aspirations of making it on Broadway, while Miriam is content to work as a waitress. Harold, with a guitar perpetually draped over his shoulder, dreams of singer-songwriter stardom — or, at least finishing his first song, a ditty about sea turtles — but is stuck slinging sandwiches for a cranky boss (Stacie Hart). The particulars of the ensuing romantic entanglements are as dull as they are laboriously detailed, but the sparks are there in this trio’s performances, whether it’s McWilliams sanguinely proclaiming her affection or Nix timidly broaching hers. Dill is impossibly winning in his interactions with both. “I’m full of surprises,” Harold boasts as he shows up on the doorstep with flowers. “You are?” says Daphne. “No,” Harold responds, and Dill finds a seemingly bottomless well of sheepish charm in a single syllable. Though the book overvalues their contributions, the supporting characters are distinctly realized in Reboot’s production, especially Jeff Church as Harold’s father, whose moving turn comes accompanied with a permanent faraway look in his eye, the wound from his wife’s untimely passing not healing over any time soon. On the opposite end of the spectrum is Kylee Gano’s amusingly wide-eyed performance as eccentric/delusional playwright Joey Storms, who can’t stop adding scenes to the already distended script he’s written for Daphne. As “Fly By Night” keeps piling on the catharses, Joey begins to seem like an inadvertent autobiographical touch.